Serve up a great resume with these writing tips. To be a successful candidate for waitress jobs, resume expert Kim Isaacs says it helps to have a resume that serves up your skill set with a side order of elbow grease. You need to show employers that what you bring to the table is exactly what they're looking for. 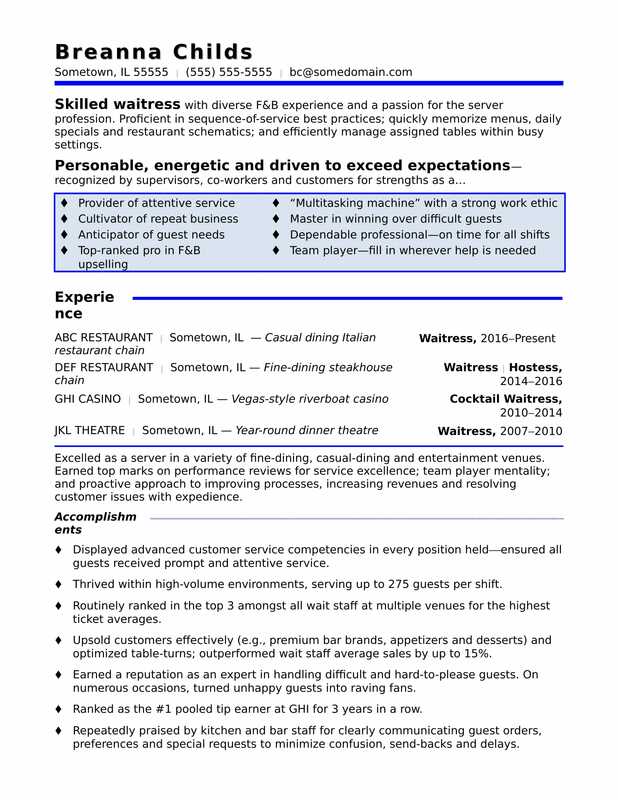 View the sample resume for a waitress that Isaacs created below, or download the waitress resume template in Word. Jobs for waitresses are projected to grow by 7% (or 182,500 jobs) from 2016 through 2026, according to the Bureau of Labor Statistics (BLS). You'll find the highest level of employment for this job in the following states: California, Texas, Florida, New York, and Pennsylvania; and in the following metropolitan areas: New York City, Los Angeles, Houston, Chicago, and Atlanta. As a waitress, you can expect to earn a median wage of $20,820 per year, or $10.01 per hour, according to the BLS. Additionally, you can search for waitress jobs on Monster. Skilled waitress with diverse F&B experience and a passion for the server profession. Proficient in sequence-of-service best practices; quickly memorize menus, daily specials and restaurant schematics; and efficiently manage assigned tables within busy settings. Excelled as a server in a variety of fine-dining, casual-dining and entertainment venues. Earned top marks on performance reviews for service excellence; team player mentality; and proactive approach to improving processes, increasing revenues and resolving customer issues with expedience. Displayed advanced customer service competencies in every position held¾ensured all guests received prompt and attentive service. Thrived within high-volume environments, serving up to 275 guests per shift. Routinely ranked in the top 3 amongst all wait staff at multiple venues for the highest ticket averages. Upsold customers effectively (e.g., premium bar brands, appetizers and desserts) and optimized table-turns; outperformed wait staff average sales by up to 15%. Earned a reputation as an expert in handling difficult and hard-to-please guests. On numerous occasions, turned unhappy guests into raving fans. Ranked as the #1 pooled tip earner at GHI for 3 years in a row. Repeatedly praised by kitchen and bar staff for clearly communicating guest orders, preferences and special requests to minimize confusion, send-backs and delays. Received “Employee of the Month” awards and similar honors, as well as exemplary ratings on performance reviews year-over-year. Food service jobs are not for the lazy; they require you to be on the move, multitasking constantly. Your resume also needs to multitask: It needs to showcase your skills and experience, as well as the value you'd add to a restaurant. Could you use some help making sure it's ready for a job search? Get a free resume evaluation today from the experts at Monster's Resume Writing Service. You'll get detailed feedback in two business days, including a review of your resume's appearance and content, and a prediction of a recruiter's first impression. Show hiring managers what you can bring to the table.